The Antarctic region has been home to numerous fishing villages, whaling stations, scientific bases, and way stations for exploration. Many of these facilities have since been abandoned, left to the snow and ice. But they still serve as remarkable time capsules to the industries and expeditions of their times. The Whalers Bay station was used by a Norwegian-Chilean whaling company in the early 1900s as a ship base. When oil prices dropped during the Great Depression, the place was abandoned. 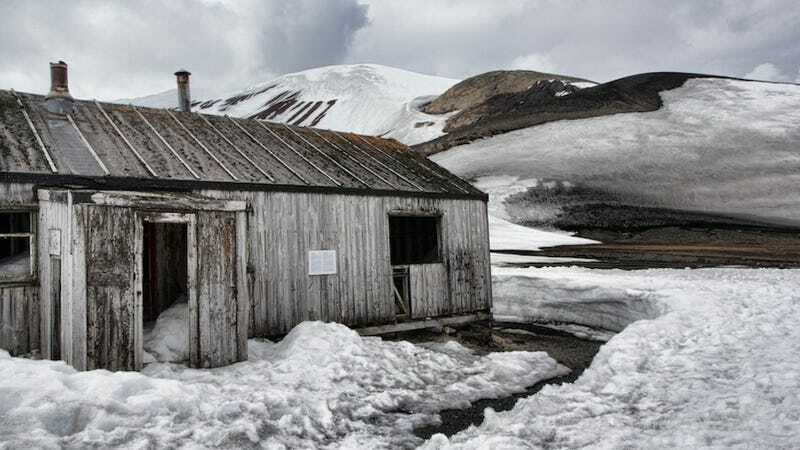 In 1944, the British Admirality and the Colonial Office built a permanent base there as the part of Operation Tabarin to establish a year-round presence in the Antarctic. However, due to volcanic eruptions between 1967 and 1969, the spot was once again abandoned and has been for more than four decades. In December 1958, Soviet scientists set up a temporary base on The Inaccessibility Pole, marked with a bust of Lenin. This place has the world's coldest year-round average temperature at -58.2°C (-72°F). The station is buried beneath the snow, but the plastic statue is still visible. If you dig down through the ice, you'll find a golden visitor's book to sign. The photos were taken in 1965 (Olav Orhelm/Norwegian Polar Institute – above) and 2008 (Stein Tronstad/Norwegian Polar Institute – below). The famous explorer simply left this fully stocked hut behind after the British Nimrod Expedition (1907-1909). You can look around here with the Google Street View. Robert Falcon Scott and his Terra Nova Expedition attempted to become the first people to reach the South Pole, but the Norwegian Roald Amundsen beat them by only a month. On the return journey, Scott and the other expedition members died from extreme cold, starvation, and exhaustion, but their hut, filled with lots of food, oil, and other goods, remains. Later the building was used by Sir Ernest Shackleton (during the Imperial Trans Arctic Expedition, 1914-1917), and his supplies are still there, as well. It was estabilished for meteorological and geological studies in 1956, but has veen unmanned since 1959. The settlement was established in 1904 by a Norwegian sea captain as a whaling station for his fishing company. It was closed in December 1966, but the church is still used occasionally for marriages. The people had their own cinema (the photo above was taken in 1993), but it collapsed few years ago. This was once the world's largest whaling centre, but has been totally abandoned since 1965. The station housed a library, a cinema, and a hospital. There is a gun mount on the hill behind the station, and another with the original 4.1' gun on the west side of the harbour.